As well as hosting the men’s Fishomania XXV Grand Final, the now infamous Dannie’s Island Lake at Maver Hayfield also accommodated the 2018 Ladies Fishomania final. This year’s event saw Kayleigh Smith, Emma, Sandra Scotthorne, Abi Kendall, Samantham Sim and Julie Abbott go head to head for the £1,000 first place prize. Fishomania XXV was Emma’s first appearance since 2014, when she succesffuly defended the title she’d won 12 months earlier. 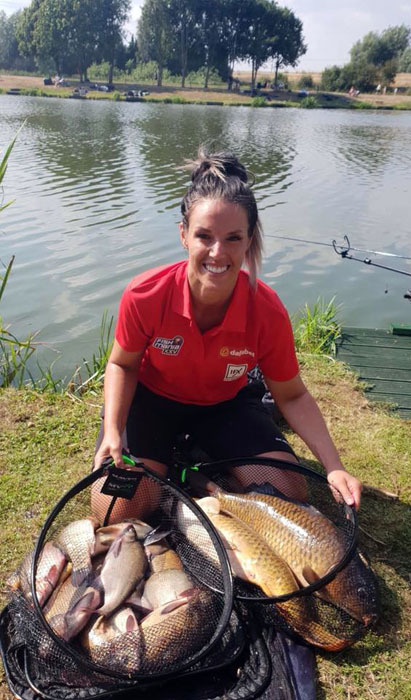 Hopes were high going into this year’s event with Emma boasting a hometown advantage at Hayfield Lakes in her bid for a fourth Fish O title. Below, Emma reflects on what was a great performance. Emma displays her second place effort at the end of the five hours – a little over 4 kilos shy of winning her fourth Fisho title. “Leading up to the Fish O Mania XXV Ladies Final I had been to Hayfield a number of times to try and formulate a plan. When the day came I felt confident my plan would work“. “Come the draw, I pulled out peg 3, which was permanent peg 65. The only issue I had with this peg was it was the narrowest part of the lake along with 67 and having anglers across from us could well affected the waggler line I had planned to fish“. “The overall approach was to fish very positive!!! On my tray I had 6mm and 8mm fishery pellets – nothing else. If I was going to win, it was by making the fishing come to me and feed“. “I had three lines of attack. Firstly, I planned on fishing a pellet waggler using my Signature Pro 11′ with a 6g float with a size 16 CS27 hook tied to 0.16 MV-R hooklength material. I chose to feed two pouches of 8mm before each cast as I’d noticed the fish had been coming to the noise during practice“. “If the day went according to plan, my second line of attack would hopefully become my main line fishing shallow at 14.5m. On this line, I set up a series 6 0.3g float with a size 16 CS27 hook tied to 0.16mm again. Choice of elastic was Maver’s Dual Core Pro 11-13 with carp being the target“. “My second rig incorporated a jigga set-up with a size 18 CS27 hook tied to to 0.14mm line with a 8-11 Dual Core elastic. I deliberately set this rig a little lighter because I wanted to catch everything on this rig and it seemed to be the best rig to catch the Carassios“. “My final line was my banker line at six metres. For this line, I set-up a 0.5g MV-R Finesse float with a size 14 CS27 tied to 0.16mm, which again, I planned on using with an 11-13 Dual Core elastic“. “When the match started it was clear to see the fishing was going to be hard so I alternating between lines to keep trying to get bites. I’ ended the match with three (3) carp, three (3) Carrasio and a good number of skimmers“. “Upon the scales making their way round, I felt confident I had a chance. I weighed in just over 17 kilos, but a lost carp in the last fifteen minutes of the match at this stage could potentially cost me! The scales carried on down until they got to Kayleigh Smith, who confirmed a weight of 21.210kg to secure the win from end peg 6“. “I was gutted to say the least with that lost fish seemingly having cost me, but I felt I fished a really good, positive match and it nearly paid off. Onto the National this weekend at Weston Pools to try and qualify again for next years event“. From everyone at Maver (UK), a massive congratulations Emma! PreviousPrevious post:Match This Qualifier no. 17 – Decoy LakesNextNext post:Maver Midlands Man Crowned Fishomania XXV Champion!